This version is outdated by a newer approved version. This version (2017/06/04 23:42) was approved by zdimension.The Previously approved version (2017/06/04 19:04) is available. These are various odds and ends that do not fit into the earlier categories. Every level file begins with a uint32_t version number. This seems to be used by the engine to guarantee compatibility between various level editor versions and the game engine version. More generally, it can be used to determine what sort of level is being read. Early TR4 demos (e.g. September 15 demo) have whole level file packed into a single zlib chunk. Therefore, there is no header. TR5 version header is equal to TR4 version header. So there is no way to tell TR4 level from TR5 level judging only by this header — you need to check filename extension as well. As it was noted, retail version of TR4 expects to load sound samples compressed in MS-ADPCM format, while TRLE version of TR4 loads uncompressed samples only. There is no way to tell retail version from TRLE version, as their version numbers are equal. This consists of 256 [tr_colour] structs, one for each palette entry. However, the individual colour values range from 0 to 63; they must be multiplied by 4 (or bitshifted by 2 to the left) to get the correct values. This used for all 8-bit colour, such as 8-bit textures. Object texture (or texture details in TRLE terms) keeps detailed information about each texture independently used in game. While it’s not texture image itself (these are kept inside texture tiles), it’s rather a reference to particular texture tile zone kept with all other necessary information to display this texture. This sub-structure used by object textures specifies a vertex location in textile coordinates. The Xpixel and Ypixel are the actual coordinates of the vertex’s pixel. The Xcoordinate and Ycoordinate values depend on where the other vertices are in the object texture. And if the object texture is used to specify a triangle, then the fourth vertex’s values will all be zero. It’s object texture structure itself. These, thee contents of ObjectTextures, are used for specifying texture mapping for the world geometry and for mesh objects. Bits 0..14 specify texture tile to use. Bit 15: if set, it indicates that texture is used on a triangle face. 0 — Texture is all-opaque, and that transparency information is ignored. 1 — Texture uses alpha testing, i.e. it may contain opaque and completely transparent regions. In 8-bit colour, index 0 is the transparent colour, while in 16-bit colour, the top bit (0x8000) is the alpha channel (1 = opaque, 0 = transparent). In 32-bit textures, transparency is specified by full magenta colour value (RGB = 255,0,255) — i.e. pixel has to be magenta to be transparent. 2 —  Texture uses alpha blending with additive operation. No depth sorting is done on alpha-blended textures. 3 — Not implemented properly in PC version, but on PlayStation this type produces alpha blending with inversion operation, thus converting all the bright zones to dark, and dark zones to bright. This blending mode was used for smooth textured shadows, footprints and black smoke sprites. There is a remnant of this blending mode in the form of entity type named smoke emitter black. 4 — Alpha-tested face without Z testing, i.e. depth information is ignored. Used for GUI elements (such as fonts) and skyboxes. 5 — Unused. Possibly was used in PlayStation versions. 6 — Wireframe mode. Used for “line particles”, such as gun sparks, water drops and laser beams. Possibly was also used for debug purposes. 7 —  Forced alpha value. It’s ordinary alpha-tested face, but alpha value for this face is overridden with global variable. Used to “fade out” specific meshes, like vanishing enemy bodies or Semerkhet ghost in “Tomb of Semerkhet” level. The structure introduced many new fields in TR4, partly related to new bump mapping feature. Assignation of bump maps happened inside level editor, where each texture piece could be marked as either level 1 or level 2 degree of bump map effect. When level was converted, all texture pieces with bumpmaps were placed into separate texture tiles after all other texture tiles, following by the same amount of texture tiles with auto-generated bump maps arranged in the same manner as original texture tiles. Number of bumped texture tiles was kept in separate variable as well (see TR4 Level Format section). So, when engine rendered a face with texture marked as bumped, it rendered original texture at first, then it jumped to the texture tile plus number of bumped texture tiles, and rendered one more texture pass on this face using texture from resulting texture tile and the same UV coordinates. Bits 0..2 — Mapping correction. It seems that these bits change the way the texture is applied. Bits 11..12 — Specifies bump mapping level (see above), so can be either 00 = 0 (no bump mapping), 01 = 1 (level 1) or 10 = 2 (level 2). Bit 15 — If set, the texture is for a triangle/quad from a room geometry. If not set, the texture is for a static mesh or model. Width and Height are helper values which specify width and height for a given object texture. OriginalU and OriginalV are unused values, which seem to identify original UV coordinates of object texture in TRLE texture page listings. These coordinates are getting messed up when level is compiled, so one shouldn’t bother about parsing them correctly. There is also null uint16_t filler in the end of each [tr4_object_texture]. int16_t NumTextureIDs; // Actually, this is the number of texture ID's - 1.
int16_t TextureIDs[NumTextureIDs + 1]; // offsets into ObjectTextures, in animation order. If a texture belongs to an animated-texture group, it will automatically be animated by the engine. Classic frames: These are ordinary animated textures, and the only type displayed prior to TR4. It is simply a list of textures that are cycled through in an endless loop; they are normally used as geographic elements of the levels (e.g. 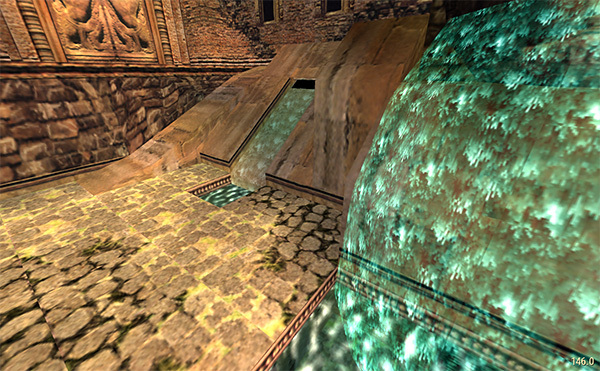 water surface, bubbling lava, Atlantean flesh walls), but practically, Tomb Raider engines are capable of applying animated textures to mesh geometry (this feature is primarily used in custom levels). The speed (interval) of animation is hardcoded, and varies from version to version. While in TR1-2 textures were animated relatively slowly, in TR3 onwards they were sped up. In foreground, you can see alpha-blended waterfall object animated with UVRotate. In background, UVRotate animation is also applied to room mesh. UVRotate mode is engaged by specifying UVRotate command in level script entry, which takes rotation speed as an argument, where speed is amount of pixel shift per each frame, considering fixed 30 FPS framerate (speed value may be negative, and in such cases pixel shift occurs in reverse direction). If such command is found (and argument is not zero — for example, UVRotate = 4), engine uses special variable value kept in level file, NumUVRotates, to determine if animation range belongs to UVRotate mode or classic frames mode. Then, if it belongs to UVRotate mode, each frame of this range is treated as individual rotating texture. There is also special case when UVRotate texture mode is engaged. When a texture is applied to a model with specific ID (so-called waterfall objects), then it is also considered UVRotate animated texture, even if it doesn’t belong to animated texture range, but only if it is a texture applied to a first face in the first mesh of the model. If there are other textures applied to other faces of a waterfall object, they won’t be considered as UVRotate. The speed of animation for waterfall objects is not affected by UVRotate script command. Instead, it is hardcoded value of 7. This data block serves for two different purposes, albeit keeping the same structure for both. First purpose is to provide positions to switch the camera to using Camera trigger action, and the second purpose is to move Lara to specified position when she is underwater, and Underwater Current trigger action was used. X, Y and Z values are coordinates of a given camera or sink. When used with camera, it is an origin point of a camera. When used with sink, it is a point, towards which Lara is pushed. Room value specifies the room where camera is placed. For sink cases, this value is used to define strength of the current which moves Lara underwater. Flag value for cameras specifies whether it’s possible to breakout from fixed camera angle. If first bit of this field is set, camera becomes persistent, and it’s not possible to bypass it with look or draw weapon buttons. For sinks, Flag value contains Box index — which is used as pathfinding reference when Lara is pushed towards sink via underwater current trigger action. Flyby cameras are cinematic interludes, in which camera flies from one point to another using spline trajectory. Each point in such sequence is a single flyby camera, and current camera properties (position, direction, roll, FOV, speed, and some more) are calculated by interpolating corresponding values from such flyby camera points — for example, if camera 0 has speed value of 10, and camera 1 has speed value of 5, then speed will gradually change from 10 to 5 when moving from one to another. Sequence is a number of flyby camera “chain” this particular camera belongs to. Maximum amount of flyby sequences in single level is 8 (however, this limit was raised to 64 in TREP). Index specifies order of the cameras in this particular sequence. Camera with index 0 will be first one in sequence, index 1 means camera will be second in sequence, and so on. Room_ID should be valid for a given flyby camera, so it will display properly, as well as have the ability to activate heavy triggers. FOV changes this particular camera’s field of view. The value is 182 times higher than the value entered in the TRLE. Roll changes roll factor of a particular camera. When this parameter is not zero, camera will rotate either left or right along roll axis, creating so-called “dutch angle”. The value is 182 times higher than the value entered in the TRLE. Timer field mainly used to stop camera movement for a given time (in game frames). As this parameter is temporal, it won’t be interpolated between two cameras. Speed specifies movement speed for this particular camera. The value is 655 times higher than the value entered in the TRLE. Make a cut to flyby from Lara camera position. Without it, it’ll pan smoothly. Tracks specified entity position (from Entities array). Creates a vignette around the picture, giving impression of “subjective” camera. 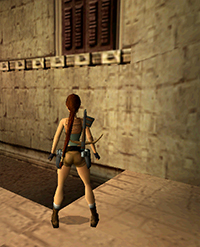 Used only with first camera in a sequence: whole sequence is treated merely as a camera “rails”, and camera itself focuses on Lara, thus creating “tracking” camera. Best example is “tracking” view in ALEXHUB2.TR4, rooms #23 and #31. Camera focuses on Lara’s last head position. For TR5, this flag is now used to hide Lara for this camera. Camera continuously focuses on Lara’s head, overriding own angle. Used only with last camera in a sequence: camera smoothly pans back to Lara camera position. When flyby arrives to this position, cuts to specific camera in same sequence. Next camera number is specified in Timer field of this camera. Stops camera movement for a given time (see Timer field). Disables all Lara controls for all next camera points. Also engages widescreen bars to create cinematic feel. Overrides Bit 10 controls lock, enabling them back. Widescreen bars remain unaffected. Camera can activate heavy triggers, just like particular kinds of entities (boulders, pushables, etc.). When camera is moving right above heavy trigger sector, it will be activated. TRLE for TR5 says this flag is used to make camera one-shot, but it’s not true. Actual one-shot flag is placed in extra uint16_t field at 0x0100 for flyby camera TrigAction. These are camera positionings and properties for cutscene frames. All the entity animations are specified separately, and they are not synced with actual camera positions. levelPosX, levelPosZ and levelRotY parameters are used, if defined, to set-up initial camera pivot position and Y axis rotation. If some of these parameters are not defined (which is the case for CUT3.PHD and CUT4.PHD), they are borrowed from X and Z position and Y rotation of entity with ID #77 (slot used for main cutscene actor, usually Lara). Also, same parameters are used as master model matrix (i. e. multiplied by them instead of using their own position and rotation) for models with IDs #77-79 (which are slots for cutscene actors). All target and pos parameters, as well as roll parameter, are encoded in the same manner as Angle parameter for [tr_entity] structure. A 32*256 array of uint8_t which is apparently for applying light to 8-bit colour, in some documentation called ColourMap. The current palette index and lighting value are used to calcuate an index to this table, which is a table of palette indices. The Tomb Raider series' software rendering, like that of most real-time-3D games, uses 8-bit colour for speed and low bulk; however, there is the serious problem of how to do lighting with 8-bit colour, because doing it directly is computationally expensive. The usual solution is to arrange the palettes' colours in ramps, which the engine then follows in the appropriate directions. However, the TR series' palettes generally lack such neat ramps. where $i$ is the original palette index, $k$ is determined from the lighting value, and $n$ is the new palette index. The lighting index $k$ varies from $0$ to $31$, and the corresponding lighting value is $2 - k / 16$ for TR1 and $2 - (k + 1) / 16$ for TR2 and TR3. This may be associated with the curious fact of the lighting values in the data files increasing in the “wrong” direction in TR1 and TR2, with $0$ being full brightness and greater values being darker. As it was briefly mentioned earlier, flipeffect is a special pre-compiled routine which is called when some non-trivial event occurs. The concept of flipeffect is somewhat similar to task, i.e. when some flipeffect is engaged, it could be flagged by engine to call every game frame (however, there are primarily one-shot flipeffects present). Such setup is needed for some complex flipeffect events, like flickering lights in TR1 Atlantis (see FLICKER_FX description), which stops automatically after some time. If flipeffect is flagged to execute every game frame, this flag can only be unset by own current flipeffect code (when its task is done — for this purpose, special internal flip timer is used to count how much time have passed since flipeffect activation) or replaced by any other flipeffect call (however, newly called flipeffect doesn’t necessarily overwrite current flipeffect flag, so you can have one-shot flipeffect executed with another one queued for continuous execution). Ergo, it’s not possible to queue more than one _continuous flipeffect at a time, but it’s possible to have one one-shot and another continuous flipeffect executed every game frame. Continuous flipeffects are mostly present in TR1 and TR2. In TR3, only two “legacy” continuous flipeffects remained, and in TR4 and TR5 there are no continuous flipeffects at all. However, there’s still legacy code that checks if there’s any continuous flipeffect queued. In this chapter, we’ll try to describe each flipeffect for every TR engine version. Given the fact that flipeffect listing changed from version to version, yet retaining common ones, the easiest way to lay them down is to create a table with flipeffect indexes corresponding to each game version. It’s possible that same flipeffect goes under different names in different game versions. In this case, legacy flipeffect name will be preserved (for historical [sic] reasons), and description will point to a flipeffect with more recent name. Legacy flipeffect names would be colored in green. Flipeffect names are directly brought from native SDK or debug listings, where available (namely TR1, TR2, and TR4). When native names are wrong (which happens in TR4 and TR5 listings), new ones will be coined. New flipeffect names would be colored in purple. It’s possible that legacy flipeffect code could migrate to later engine version without changes, but could be broken due to missing code in another part of engine or changes in internal structures. In this case, flipeffect name would be colored in red. If there’s an entry in engine’s flipeffect list, but no actual code for it, it would be marked as (-). If actual flipeffect’s purpose is unknown, it would be marked as (?). If flipeffect ought to be continuous, it will be marked in bold. As mentioned here, flipeffect could be called in two ways — either by an entity via AnimCommand, or by trigger action. However, there are certain flipeffect which strictly require caller entity ID to work with (see effect descriptions for that). In such case, if flipeffect is called by trigger action, resulting outcome is undefined in original engine. The most sane way to deal with this situation is to pass an ID of entity which activated given trigger. On contrary, some flipeffects may require certain trigger action and/or certain trigger type to be called at the moment. In such case, if flipeffect is called via AnimCommand, resulting outcome is undefined in original engine. In original engines, all flipeffects which name begins with LARA_ prefix automatically take Lara character as an entity to work with. Also, most flipeffects with _FX postfix are simple sound effect events. ROTATE_180 — Rotates an entity 180 degrees around yaw axis and also around pitch axis for underwater cases. Mostly used in Lara roll animations. This flipeffect needs special approach if original animation frames are interpolated, because usually rotation is done on animation transition (e.g., frame 5 of Lara animation 48, which is second and final part of her roll movement). To prevent stray misaligned interpolated frames, this flipeffect must be performed only in the end of frame-to-frame interpolated sequence. TURN180 — Same as ROTATE_180. 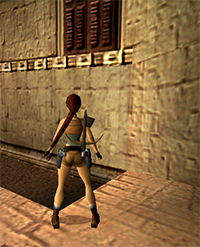 LARA_NORMAL — Resets certain internal Lara parameters to default ones, including movement modes, FOV and camera position. FLOOR_SHAKE — If entity producing this effect is in less than 8 sector range, send shake effect to camera. Shake effect is a variable which is inversely proportional to entity distance, and, when sent to camera, makes it shake with corresponding amplitude gradually fading out. If there are multiple FLOOR_SHAKE events constantly occuring nearby camera, shake effect won’t accumulate, but rather overwrite previous value. DINO_STOMP — Same as FLOOR_SHAKE. LARA_BUBBLES — When underwater, emit bubble sound (ID #37) and produce bubble particle for Lara. Position of bubble is linked to model’s last mesh (which is headmesh in case of Lara). FINISH_LEVEL — Same effect as TrigAction 0x07 — immediately loads next level. For TR4, (which requires explicit level index to jump), current level index is increased and passed as level index to jump to. FLIP_MAP — Equal to TrigAction 0x03. ACTIVATE_CAMERA — If there is a trigger type Key (SubFunction 0x03) being queued at the moment, and there are any Camera TrigActions (0x01) present in ActionList, these TrigActions will be forced to activate at a given frame of keyhole entity current animation, rather than at the ending frame of it. Works only for keyhole entities which have complex activation animations, not single-frame ones. It can be used to change camera POV before keyhole animation is finished. ACTIVATE_KEY — Same as above, but works for Object TrigAction. That is, any entities to be activated from ActionList will be activated at a given frame of keyhole entity current animation, rather than at the ending frame of it. Can be used to activate entities before actual keyhole animation is finished. LARA_HANDSFREE — Functionally removes any weapon from Lara’s hands. If called during holstering or unholstering operation, immediately aborts it. Note that holstering animation won’t be automatically performed, and weapon model meshswaps won’t be swapped back to normal hands. DRAW_RIGHTGUN — Swaps given entity’s mesh #10 index with same mesh’s index from PISTOLS_ANIM model (model ID #1 in all TR versions). Calling this effect again swaps mesh #10 back to native. Used primarily in cutscenes to create an illusion of Lara getting pistol in her right hand. DRAW_LEFTGUN — Swaps given entity’s mesh #13 index with same mesh’s index from PISTOLS_ANIM model (model ID #1 in all TR versions). Calling this effect again swaps mesh #13 back to native. Used primarily in cutscenes to create an illusion of Lara getting pistol in her left hand. SHOOT_RIGHTGUN — Activates given entity’s muzzle flash effect and dynamic light near mesh #10. Muzzle flash position and orientation, as well as effect duration and intensity is hardcoded. Used primarily in cutscenes. SHOOT_LEFTGUN — Activates given entity’s muzzle flash effect and dynamic light near mesh #13. Muzzle flash position and orientation, as well as effect duration and intensity is hardcoded. Used primarily in cutscenes. MESH_SWAP1 — Swaps all given entity meshes with MESH_SWAP1 model meshes (model ID varies across TR versions). Each mesh is swapped only if source meshswap model mesh is not null, otherwise swap is ignored for a given mesh. Calling this flipeffect again swaps all meshes back to native. Used primarily in cutscenes. MESH_SWAP2 — Swaps all given entity meshes with MESH_SWAP2 model meshes (model ID varies across TR versions). Each mesh is swapped only if source meshswap model mesh is not null, otherwise swap is ignored for a given mesh. Calling this flipeffect again swaps all meshes back to native. Used primarily in cutscenes. MESH_SWAP3 — Swaps all given entity meshes with MESH_SWAP3 model meshes (model ID varies across TR versions). Each mesh is swapped only if source meshswap model mesh is not null, otherwise swap is ignored for a given mesh. Calling this flipeffect again swaps all meshes back to native. Used primarily in cutscenes. SWAP_CROWBAR — Swaps given entity’s mesh #10 index with same mesh’s index from CROWBAR_ANIM model (either model ID #246 in TR4, or model ID #240 in TR5). Calling this flipeffect again swaps mesh #10 back to native. Used primarily in cutscenes to create an illusion of Lara getting crowbar in her hand. POURSWAP_ON — Swaps given entity’s mesh #10 index with same mesh’s index from LARA_WATER_MESH model (TR4, modei ID #25). Used in Lara’s waterskin animations used in late TR4 levels with waterskin puzzle. POURSWAP_OFF — Swaps given entity’s mesh #10 back to native. Used in Lara’s waterskin animations used in late TR4 levels with waterskin puzzle. INV_ON — Hides given entity. INV_OFF — Shows given entity, if it was hidden. DYN_ON — Turns dynamic lights on for a given entity. Actual result is unclear. DYN_OFF — Turns dynamic lights off for a given entity. Actual result is unclear. RESET_HAIR — Presumably used to save Lara’s ponytail from potential stuck during cutscenes by resetting all hair parameters to “identity”. SETFOG — When called by trigger action, changes global colour for volumetric fog effect. Takes TriggerSetup Timer field as an index into hardcoded RGB table of colours (see this section for more info). If specified index is 100, engine temporarily turns off volumetric fog effect (possibly, this was used for debug purposes). GHOSTTRAP — Kills all the living WRAITH3 entities (model ID #88 in TR4) this way: the wraith starts falling towards given entity. Reaching it or not, the wraith will die if it hits the floor of the room. CLEARSCARABS — Removes all swarms of scarabs currently wandering in level. KILLACTIVEBADDIES — Disable and remove all active NPCs from level. CLEAR_SPIDERS_PATCH — Present only in TR5. It seems it’s same as KILLACTIVEBADDIES, but some other processing is done. Never used in actual levels. LARALOCATION — When activated, makes Guide NPC (TR4, model ID #37) or Von Croy NPC (TR4, model ID #39) to move to specific AI_FOLLOW object. Takes TriggerSetup Timer field as an index to search for such OCB within AI objects array. When AI_FOLLOW AI object with same OCB index is found, NPC is then directed to this AI_FOLLOW object. This flipeffect also stores this index in additional global variable which is used to prevent NPC to get back to AI_FOLLOW objects with lower OCB indexes that were already passed — for example, if NPC already passed AI_FOLLOW with OCB 2, he won’t return to AI_FOLLOW with OCB 1, even if he hasn’t been there before. LARALOCATIONPAD — Same action as LARALOCATION, but with one difference - Timer field is checked for certain values to engage either specific soundtrack and/or cinematic dialogue with Von Croy NPC (for demonstration, look for Angkor Wat level walkthrough). This additional behaviour is hardcoded for TR4’s first level index only. ASSAULT_RESET — Resets assault course clock (for ex., when Lara stepped out of assault course). ASSAULT_STOP — Stops assault course clock. ASSAULT_START — Starts assault course clock. ASSAULT_FINISHED — Finishes assault course clock and fixes the record. Depending on record time, plays either unbeat record (“I’m sure you can do better”, track ID #24 in TR2) soundtrack or best record (“Gosh, that was my best time yet”, track ID #22 in TR2, #95 in TR3) soundtrack. Record time is hardcoded to 100 seconds in TR2 and to 180 seconds in TR3. In TR3, flipeffect also checks if all targets in shooting range were hit by Lara, and if not, applies penalty of 10 seconds for each unhit target. Also, TR3 lacks “unbeat record” soundtrack. ASSAULT_PENALTY_8 — 8-second penalty for losing track on assault course. ASSAULT_PENALTY_30 — 30-second penalty for losing track on assault course. RACETRACK_START — Prepare racetrack timer for counting lap time. Only works when Lara is on a quadbike! As soon as quadbike leaves sector with this flipeffect, timer will start counting. RACETRACK_RESET — Resets current lap time. Only works when Lara is on a quadbike! RACETRACK_FINISHED — Finishes racetrack timer and fixes the record. Only works when Lara is on a quadbike! GYM_HINT_1-19 — Sequence of Lara’s voice hints on how to complete gym training. Reason why these are activated via flipeffects rather than normal soundtrack is they must be engaged in predefined order, e.g. voice hint #8 can’t play before #7 was played, and so on. GYM_HINT_RESET — Resets gym training progress, so all voice hints will be played once again. TUT_HINT_1-12 — Sequence of Lara’s voice hints on how to complete tutorial on Streets of Rome (TR5). Setup is similar to GYM_HINT flipeffects, but seems that there’s no reset flipeffect to restart tutorial. RAISINGBLOCK_FX — Plays global sound with ID 117. Used in TR1, Palace Midas. CHAINBLOCK_FX — Plays global sounds with ID 173 and ID 33 with predefined interval. Used in TR1, Tomb of Tihocan. EARTHQUAKE_FX — Shakes screen violently and plays sounds with ID 99 and 70 globally with predefined intervals. Used in TR1, Palace Midas. STAIRS2SLOPE_FX — Plays global sound with ID 119 with predefined delay. Used in TR1, City of Khamoon. SAND_FX — Plays global sounds with ID 161, 118 and 155 with predefined intervals. Used in TR1, City of Khamoon. POWERUP_FX — Plays global sound with ID 155 for 1 second. Presumably used in TR1, one of the Atlantis levels, but never appears on map. FLICKER_FX — Flips alternate rooms back and forth several times with predefined intervals, creating illusion of flickering light. Used in TR1, first room of Atlantis. CHANDELIER_FX — Plays global sound with ID 278 for 1 second. Used in TR2, Bartoli’s Hideout. BOILER_FX — Plays global sound with ID 338. Used in TR2, Wreck of the Maria Doria. PISTON_FX — Plays global sound with ID 190. Used in TR2, Living Quarters. CURTAIN_FX — Plays global sound with ID 191. Used in TR2, Living Quarters. SET_CHANGE_FX — Plays global sound with ID 330. Used in TR2, Opera House and Temple of Xian. STATUE_FX — Plays global sound with ID 331. Used in TR2, Barkhang Monastery. RUBBLE_FX — Plays global rumble sound FX and holds camera shake effect for some time, then finishes it with “shutting” sound. If there are any earthquake type objects in a level, engine engages same behaviour locally for these objects. TIMER_FIELD_FX — If this flipeffect is called by trigger action, play global sound FX, taking TriggerSetup Timer field as a sound ID. EXPLOSION_FX — Plays global explosion sound (ID #105) and produce full-screen flash graphical FX (TR3-5) or camera shake effect (TR1-2). FLOOD_FX — Plays global flooding sound (TR1 — ID #81, TR2 — ID #79, TR3 — ID #163, TR4 — ID #238). Implementation differs from version to version — in TR1 and TR2 looped waterfall sound is used (which is then stopped by an engine after 1 second), while in TR3 and TR4 one-shot sound is engaged.